十面埋伏 (Ambushed, Pipa, 琵琶曲, Shi Mian Mai Fu) is a best-known piece for the pipa based on historic events, and is one of the top 10 Chinese classical music masterpieces. The earliest extant tablature can be found in Hua Qiuping’s pipa score dated 1818, but the origin and composer remain unknown. It is clear that, the music had been popular before or during Tang Dynasty (618-907) at least, according to the famous poem of The Song of Pipa by Bai Juyi (772-846). 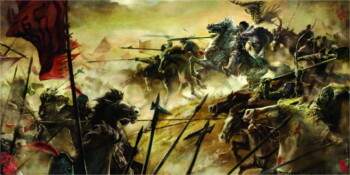 The story behind this music is the key battle of the epic war of Chu vs Han in 202 BC. Xiang Yu, the King of Chu, was ambushed by his rival Liu Bang, the king of Han (later became the Founding Emperor of Han Dynasty, 206BC – 220AD), and had to kill himself. Although defeated, Xiang Yu has been admired by many Chinese warriors, due to his fearless spirit and calmness under extremely disadvantageous situations. The music brings you back to the battlefield and lets you experience the whole process of the battle. The music consists of 13 sections or 3 parts. Part I is on preparing the war; part II on the fighting and the last part is on the loss of Chu and Xiang Yu’s suicide. Play Shi Mian Mai Fu (Pipa,十面埋伏,琵琶曲) with HTML 5 Player, no flash required, no software required. You may buy more Pipa music CDs or MP3s from Amazon. Here is the list of recommended Pipa (琵琶) music CDs and MP3s.